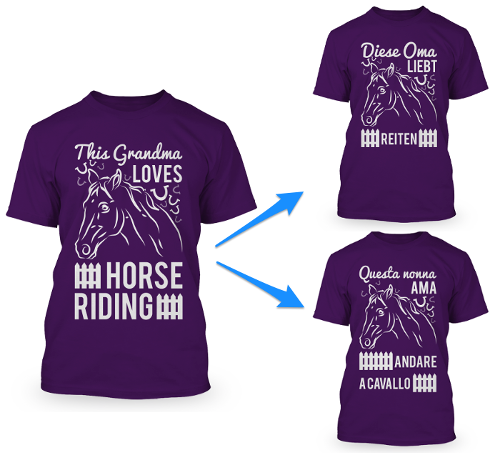 Tony is a perfect example of Teespring seller who is able to sell thousands of products each month on Teespring’s Boosted Network by adapting his successful english designs for global markets. Interested in expanding your sales globally? Finding international buyers is easier than you think, check out our video below for more info. If you have a design that was successful in the US you might be able to re-use it in Europe without any changes. You can start by targeting English-speaking countries like the UK (England, Scotland, Wales, Northern Ireland) and Ireland. Additionally, many European countries like the Netherlands, Germany, Scandinavia and Switzerland have large English speaking populations. If there are no major differences then check the audience size in Audience Insights on Facebook. Simply choose the same targeting you would use for the US and only change the target country. As the US is much larger than the UK you might have to add a few interests to increase the audience size (ideally between 50k – 150k people). Adapt your Facebook ads targeting for your global listing with the same or slightly expanded targeting. A simple yet effective strategy that does not require translation is focusing on expats. People who live far from their native country are usually nostalgic for their homeland and more likely to showcase their national pride; a unique custom t-shirt can be the perfect way to do that! A design featuring the text “I might live in [the UK], but I’ll always be from [Paris]” is a great example of an expat design. Don’t forget you might need to adapt a current design and create a new listing before targeting a new EU market. Spelling – Keep in mind that there are some spelling differences between American and British English like mom = mum, color = colour, etc. So if you have a design for moms then make sure you spell it “mums” on the tee. Example: I’m a tattooed mum – just like a normal mum except much cooler. Adjusting for new niches – A lot of popular designs can be applied to new audiences simply by amending a few keywords. For example, if you want to use a phrase like “Softball Mom – some dream their entire life of meeting their favorite player, I raised mine”, you would just need to google if it’s a popular sport for children in Britain as well. In your research, you will quickly notice that the British are much more interested in sports like cricket and rugby and so you probably won’t find too many people interested in buying a softball themed design. So simply replace “softball” with rugby, make any spelling adjustments needed (mom = mum, favorite = favourite) and you’re ready to go! When you translate designs into different languages you can increase the number of potential buyers! Apart from English, the most widely spoken languages in the EU are German, Italian, French, Spanish and Polish. The UK is one of the biggest EU markets right now, but Germany and France are not far behind; if you’re not translating listings you could be missing out on these new markets! You should pay particular attention to translating the following elements. If you plan on selling your designs on the Boosted Network it is VERY important for you to translate your listing titles—this is key for optimizing listings for global marketplaces. See how easy it can be to translate existing designs? On Freelancer, Peopleperhour, and Odesk, you can post a “job” explaining what you need and people will place a bid with the cost and turnaround time they can do it for. Then you choose the freelancer that has the best price and experience (look at their reviews) for the job! On Fiverr, you can find people who will translate up to a certain word count for $5. Again, look at their reviews to make sure they can be trusted to provide a quality translation. No matter which site you choose, make sure you work with native speakers! Cultural Context – When you ask for a translation, give some context so that the freelancer understands what the design is going to be used for and who the target audience is (including gender–remember, some languages will require different versions of the design for men and women). Design Context – If you havean English version of the design include the image with your translation request so the translator understands what you want to use the text for. Tone – specify the tone (formal/informal) and if your design uses any “slang”, ask the translator to find the best match in their language. Build a Relationship – Once you find a good translator to work with, you should continue using them for all your translation needs in that language because the more they work with you, the more they’ll understand what you’re looking for! While US buyers like bold statements with big images and texts Europeans tend to go for “lighter” or more subtle design elements. US designs also sometimes bring a level of intensity that doesn’t resonate in Europe. For example; designs for the US biker niche tend to include elements like skulls, flames, etc. However if you research the German motorcycling niche, you will notice that while this audience is passionate they prefer a slightly less aggressive design. Discovering a new niche can be a great way to enter into an untapped market. With a little bit of work you can find an audience that has never seen products designed around their interests before. The video below provides a quick, step-by-step example of how we researched a new niche for French-speaking markets.